I think we can all agree at this point that the “white after Labor Day” rule is no longer a valid one. While I personally wouldn’t don anything eyelet or a breezy LWD once the temps have dropped, I’m certainly not putting my white denim away anytime soon. I brought my favorite pair with me to London and have been throwing them into the mix every once in a while to take a break from standard blue and black. Since I have a thing for being matchy-matchy, I decided to pair them with this soft navy + white striped tee (only $20!!!! 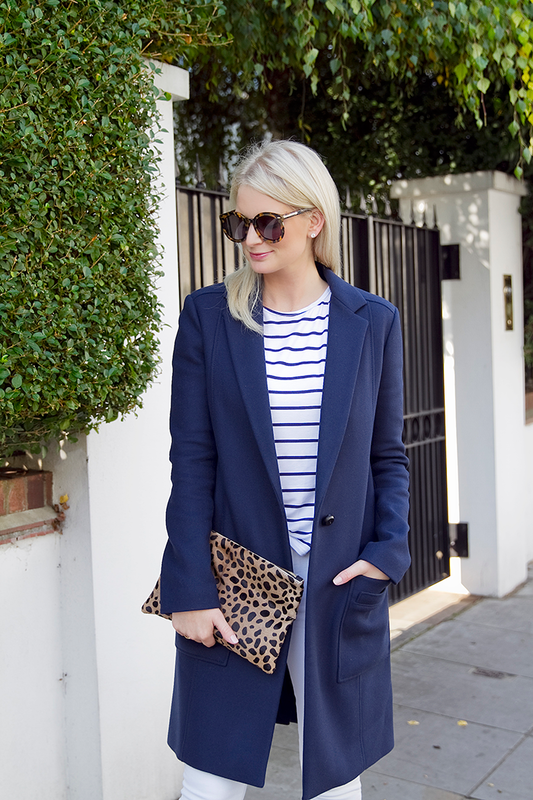 also available here), and a classic lightweight coat (love this one). I topped it off with my calf-hair Clare V. clutch for some texture and added interest – a simple, chic outfit that’ll look great all day! 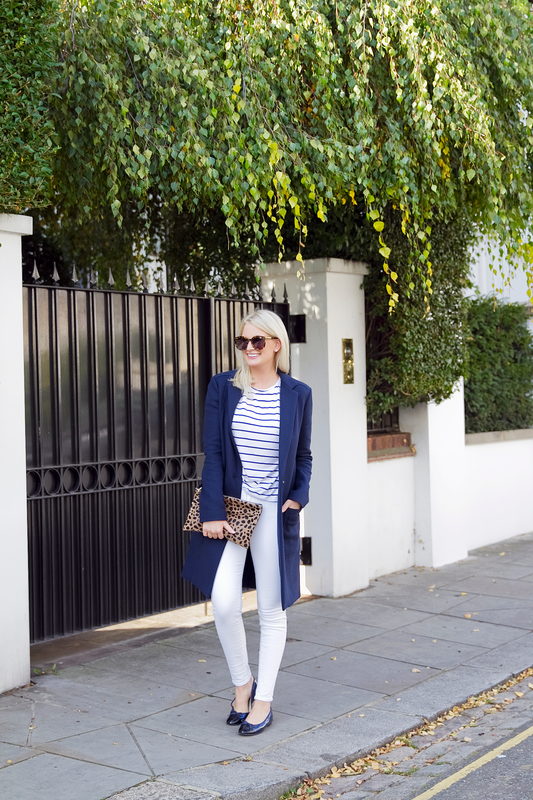 Stay tuned tomorrow for more white jeans after Labor Day outfit inspiration! This is such a clean look, love all the white. Gorgeous! Totally agree about wearing white after Labor Day — it’s all all about the textures and how it’s styled. This is perfect, and that leather collar detail is amazing. Love that coat. The pop of leather is just perfect! I’m still rocking my white jeans after Labor Day! 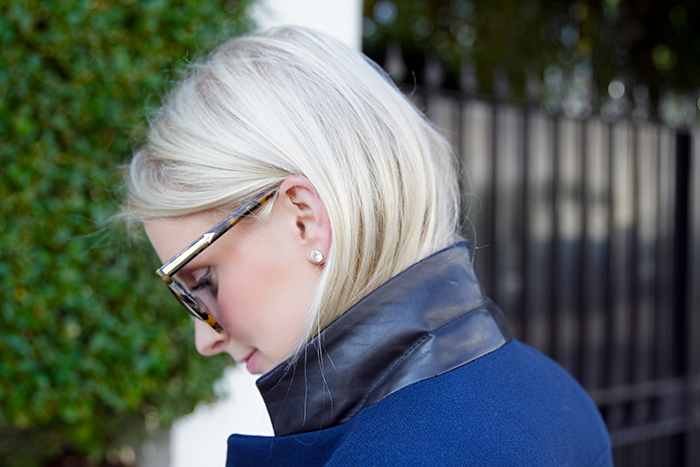 I also love the leather trim under the collar of this coat! I’m such a sucker for any leather lining detail on a coat or jacket! 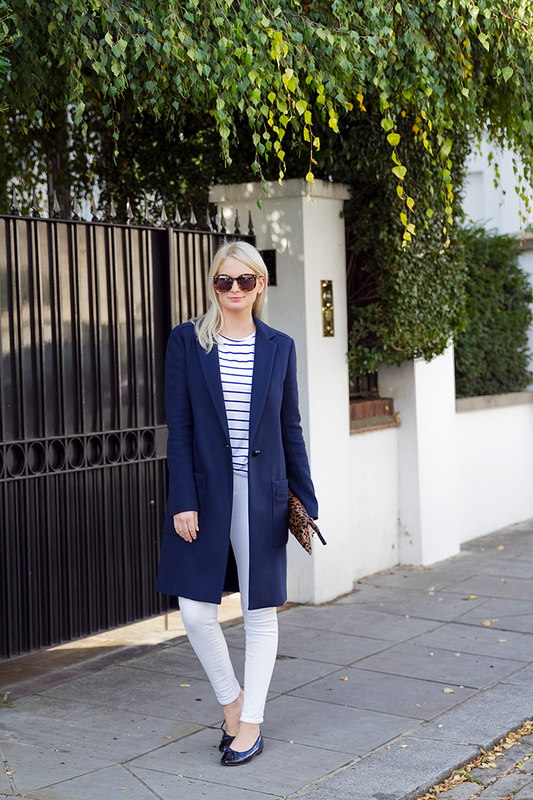 Love the white/navy combo and I totally agree…white denim is absolutely necessary year round! Love this. I haven’t worn my white skinnies for a while as it’s been honestly too hot for jeans but hopefully it’ll cool down here in LA relatively soon! Um yessss! 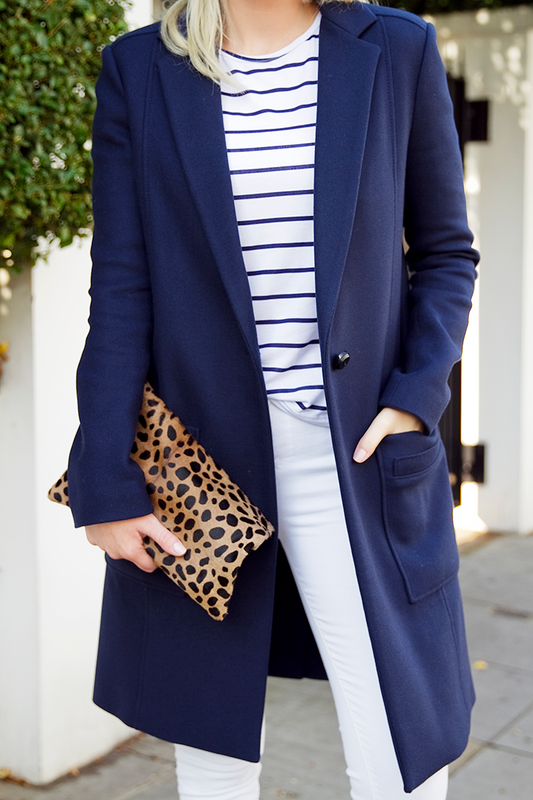 The stripes with the leopard paired with classic navy- love the whole look!